I have been meaning to write about my Starbucks mug collection forever, but photographing the mug that started the collection was always a problem. 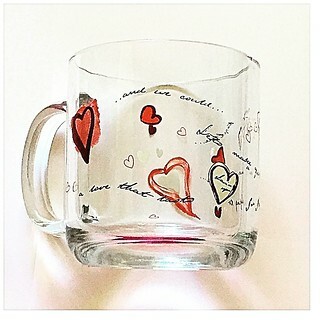 It was a nondescript undbranded mug in clear glass, and transparent glass is always a challenge. But here it is, finally. Note that I had written about this back in 2008, but I can’t even see the graphic anymore, probably because it is an outdated link from the first blog platform I used to house this blog in. It orinally came as part of a Valentine’s Day gift set of cookies and coffee, if I remember right, and after the 14th, they split up the collection and sold this on sale. This was in February 2001 when I had just started working. So this mug does not only represent the beginning of a collection, but it was also one of my first real purchases with my own money. I don’t normally use my mugs but this one, I do. Not just because it was the first, but because it has all these pretty pink hearts. I have been putting away the mugs I have acquired through the last 2-3 years, but I do know I’ve hit the 100+ mug mark a while back. Life has made me put the collecting on hold, but friends have continued to bring me one from their travels or from just around here– so the collection has been growing. In fact, it’s the last few mugs that I have received that has prompted me to finally start writing about the collection. I’m hoping I can finally get a more up to date photo album going. There were Starbucks mugs in the pantry when I got here, one or two they had purchased in previous trips, but it was a determined effort to get mugs as souvenirs in my travels that prompted me to start the collection. I actually had a regular mug collection from my teens back home, and there was even a time when I gave them away as Christmas gifts, filled with some chocolates. I think a mug or two has survived that collection, but I didn’t take any with me when I got here. Starbucks was already in Manila a year or two before I left, but it never even occurred to me to get the first mug they had as a souvenir back then. I did get my Manila mug after my first trip back home in 2002. I had some space on my kitchen cupboard, and I wrapped my mugs in cling wrap and displayed them in two rows until I ran out of space. With a do-it-yourself redecorating in mind, I’m still trying to figure out the best way to display the mugs when I finally bring the collection together. Meanwhile, I washed my first mug and drank my morning coffee from it. Like I said, I have received some meaningful additions the last couple of weeks– not so much for the uniqueness of the new mugs– but for the stories behind them. I didn’t feel right about just writing about any mug without writing about this one, because collections are always most interesting when you go back to when you started them. At least it is for me. The next question is usually how long you have been collecting, and that gives you 16 years as of this writing for my Starbucks Mug Collection. I don’t go out of my way to collect them, but well meaning friends remember and give them to me without my asking. I still look at the sale or clearance sections the few times I actually walk into one of the many Starbucks stores around me, but knowing my mugs are mostly hidden stops me from getting more. I want to catalogue them first and figure out a way to display them or store them as a cohesive collection. Will I trade? 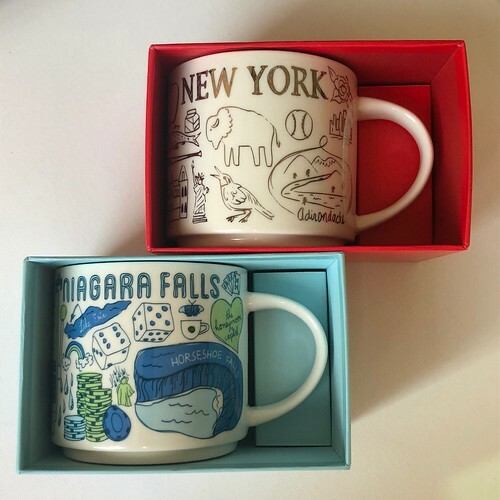 Only for your city or country mug for my New York City mugs, please. I have received inquiries about a mug or two in my flickr album, once upon a time even getting a $200 offer for one of my Christmas city mugs. I had to say no. What’s in my collection will remain in the collection — at least until that time that I decide it’s time to let the collection go. Not quite there, and I don’t think I will ever get there. My Starbucks mugs have a sentimental value to me, so much so that I have declared them my personal property. Even if there was a time I had shared the collecting with someone else, the collection is mine. These mugs embody memories of good times and happy travels, of friendships and warm thoughts that made people think of my collection and contributing to it. And more happy memories and warm thoughts are yet to come.. I look forward to more mugs joining my collection. So on the day I had stayed home last week, I took a peek out my window to see if the mailman had already made his regular pass, and when he did, I went down to grab our mail. I looked down the door mat when I opened the door and there was this square priority mail box from the USPS with my name on it and a familiar name on the return address tag. I have never had the good fortune to meet up with Lou in person, but I have had a longstanding friendship on the web with her, mostly because of our off and on conversations on this blog and hers over at Multiply. In fact the truth of the matter is, I joined Multiply because of her. 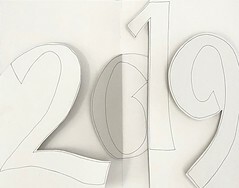 She and I pop in and out of each others’ comment boxes, and try to keep track of the goings on in each others worlds through our little spaces ont he blogsphere. I opened the box and found — ta-dah! — the latest addition to my Starbucks Mug Collection. 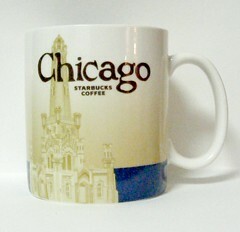 Finally: Chicago is on my shelf.. Maraming, maraming salamat, Lou!